Since ancient times, Mother Nature has provided the healing power to care for your body, mind and even mouth. 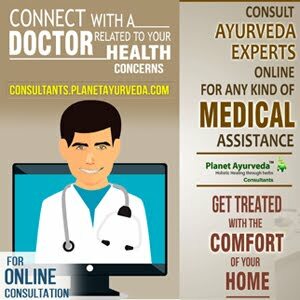 For thousands of years, Ayurveda has been advocating and providing a wide range of natural remedies to effectively cure tooth decay, prevent tooth cavities, relieve toothaches, reduce the formation of plaque, and treat receding gums. This article is written to empower you to care more for your own teeth and gums, and as a result have a healthier mouth with fewer dental problems. The first thing in the morning, scrape your tongue with a tongue scraper or the back of a spoon to remove any mucus especially on the back of the tongue. The tongue should be pink and clean. Very gently brush with a simple tooth powder such turmeric powder with cinnamon powder and a little neem powder. You can just use turmeric but many other substances depending on the condition of your teeth and gums can be used. Salt can also be used or added in small amounts. Sea salt is also a very effective way to clean your teeth when you don't have any other choices. Charcoal, on the other hand, works very well in times of infection even for a tooth ache. After brushing, rinse the mouth thoroughly and gargle with a disinfecting formula such as filtered mineral water with 1 tsp. of Himalayan salt, a pinch of baking soda (aluminum free), about 10 drops of tea tree oil and 3 drops of clove oil (optional). Next, afterbrushing and rinsing, do oil pulling by taking about 2-3tsp. of sesame oil (not coconut oil) in your mouth and "pull and push" the oil between the teeth for about 5 minutes before spitting out the oil. You can massage your gums too if necessary. Then, in between meals clean your teeth and massage your gums with a wooden tooth stick (Miswak stick). Carefully scrape away any buildup of bacteria, food or plaque around the gum line both on the inside and outside of the teeth. The cinnamon and neem are very good for the gums. The sea salt is also good for the gums and cleanses the teeth well. Flossing and using a toothpick is essential since most decay and cavities happen between the teeth and at the gum line. The rinse with the baking soda makes oral cavity alkaline to prevent bacterial growth, while the tea tree oil and clove oil will prevent any infection even if you have a cavity at the time. The oil pulling is very beneficial to the gums using sesame oil instead of coconut oil will further fight infection in the case where there is a cavity, gum disease or tooth decay. Scraping or cleaning the tongue daily especially before bedtime and again in the morning removes any bacteria buildup and mucus which will keep the mouth healthy, improve your breath and reduce unhealthy bacteria buildup on the teeth. This process can relieve you from the pain, tooth decay, cavity or abscess in the mouth. Eventually, if you continue with this process particularly the rinse with the tea tree oil and clove oil throughout the day, it will reduce the pain and avoid infection, thus avoid the need for a filling, in most cases. However, you have to diligently continue with cleansing out the decayed area of food after every meal and keep rinsing with the salt formula to avoid infection in the case of a cavity. If you have an infection which will be noticeable with inflammation and pain, then you can put a very small amount of clove oil on the infected area and even use more clove oil in the salt solution to numb the nerves. The same can be done for abscesses. Additionally, if you have an infection then you should take garlic oil and/or oregano oil internally daily until the infection resides. These extra measures must be done for at least a month in the case of a serious infection or an abscess. Use herbs that are high in minerals such as alpha, oat straw, marshmallow root and others strengthen the teeth and bones. In addition, consuming raw dairy products and taking cod liver oil regularly will prevent bone loss and help support strong, cavity resistant teeth. 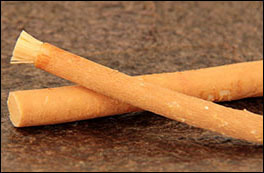 For more than 1,000 years, the world has used the Arab chewing sticks (Miswak) as an oral hygiene aid. The Miswak contains a large portion of gall, an anti-mildew substance and an antiseptic astringent that stops bleeding of gums and strengthen it. Amazingly, the Miswak has natural minerals that kill microbes and germs and remove plaque. Because of its healing properties it prevents bacterial growth in gums and thus prevents tooth decay. I bet your toothbrush can do that! The Miswak stick is a gift from nature for our teeth since it heals the gums and cleanse the teeth without toothpaste. I use one daily especially when drive my car. I highly recommend this product: Planet Ayurveda Gum Care Powder. It has a simple name but it is made with excellent herbs known to support healthy oral hygiene and gums. Gum Care Powder is a purely herbal preparation available in Planet Ayurveda for maintaining the hygiene and healthy condition of oral cavity which includes our teeth, oral mucosa, tongue, gums and teeth supporting structure. It can act as total mouth rehab. This powder is prepared by merging together such herbs which contains natural compounds having protective properties for teeth, gums and whole oral cavity. Gum Care Powder provides oral protection giving relief from various dental problems. Its herbs have made it a multiple usable natural product with properties of being ant-inflammatory, anti-microbial, analgesic and mouth freshener etc. It keeps the oral tissues healthy thereby very good natural product to maintain the oral hygiene. Its effective use in case of Gingivitis providing relief from inflammation, pain, swelling and bleeding gums. It can alleviate the symptoms of Pyorrhea. Prevents the development of caries and further tooth decay. Helpful to keeps the gums healthy. It is also an effective herbal remedy for mouth ulcers. 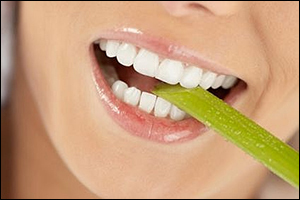 Its herbs are effective in removing the plaque and stains from the teeth and helps in whitening of teeth. Its regular use keeps the freshness of the mouth. It has ability to combat toothache. It can reduce inflammation by release of abscess. Maintains the pH of the mouth balancing the flora of the oral cavity providing proper oral hygiene. It is also efficient against bad breath by elimination causative bacteria. Overall it is a potent and efficient natural product for the care and health of oral cavity. How Herbs used in this product helps in oral dental problems? Sonth (Zingiber officinale): It is actually ‘dry ginger’ and is an anti-oxidant and anti-inflammatory herb which can improve the immunity to fight against infection and provide relief from pain and swelling. It is a natural useful agent for tongue and throat clearing. Haritaki (Terminalia chebula): Gargling with fruit decoction of Haritaki gives excellent results in stomatitis (Mouth ulcers) relieving inflammation in the mucous membrane of the mouth. Mustak (Cyprus rotundus): It is commonly known as Nut grass. Roots of the plant are used for medicinal purposes. Khadir (Acacia catechu): Khadir is herb with cold potency having properties to improve quality of teeth, providing strength to teeth and treat the mouth ulcers. It can even correct the distaste. Consumption of its extract as gargle provide relief from gingivitis, Pharyngitis and stomatitis. The delicate twigs of Khadira can be used as tooth brush because of its anti–microbial and natural cleansing properties and has preventive action in dental caries. Karpur (Cinnamomum camphora): Karpur is a coolant herb that balances Kapha dosha. It is anti-inflammatory in nature. It can help to get rid of mouth dryness, cures bad breath problem and clears throat. It is effective in treating toothache. Poog (Areca catechu): Poog also known as Betel nut is an anti-inflammatory agent and has found its uses in relieving tooth related problems. It has properties to Increases the flow of saliva, relieves out bad breath, and strengthens the gums. Marich (Piper nigrum): Commonly called as Black Pepper has natural activities of fighting against tooth decay and gum swelling. Lavang (Syzygium aromaticum): Lavang is generally known as clove, is being used as Ayurvedic medicine since ages. Clove oil application has anesthetic effects and it effectively give instant relief from toothache and gum related problems. Clove oil also supports to alleviate the problem of bad breadth. Twak (Cinnamomum zeylancia): It is used as a herb in relieving tooth related problems. Safatika (Alum): Safatika is an antiseptic which acts as remedy against tooth decay and thus prevents cavities as well as strengthens the gum. It can be also used as mouth wash mixing it with water.